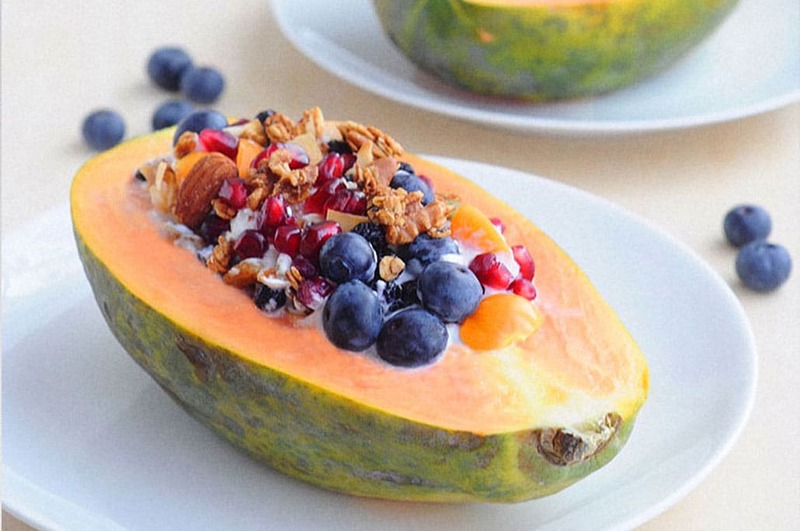 My Vegan Breakfast to start the day is a Papaya Bowl full of granola that is sugar-free and gluten-free. It’s easy to whip up and perfect for a vegan breakfast brunch. 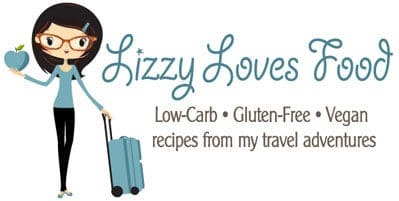 With a vegan breakfast bowl full of non-dairy yogurt and sugar-free granola, I am full till lunch and helps me to stay on my low-carb diet for January. Not to mentioned it brings me back to breakfast in Bermuda. Every morning there were trays of fruit with different yogurts to pick from along with toppings to finish off your savory breakfast bowl. As so many of us have started our New Year’s resolution, I am back to No MEAT Mondays and my vegan breakfast recipes are pretty easy to make. A healthy breakfast is the best way to start my day. When I eat a healthy breakfast, which is usually late morning, I tend to be less hungry during the day. I usually make up my vegan breakfast papaya bowl with what I have in the house. Sometimes I will add chia pudding instead of vegan yogurt from Forager. Another thing that my husband loves are frozen bananas to put into the papaya bowl. 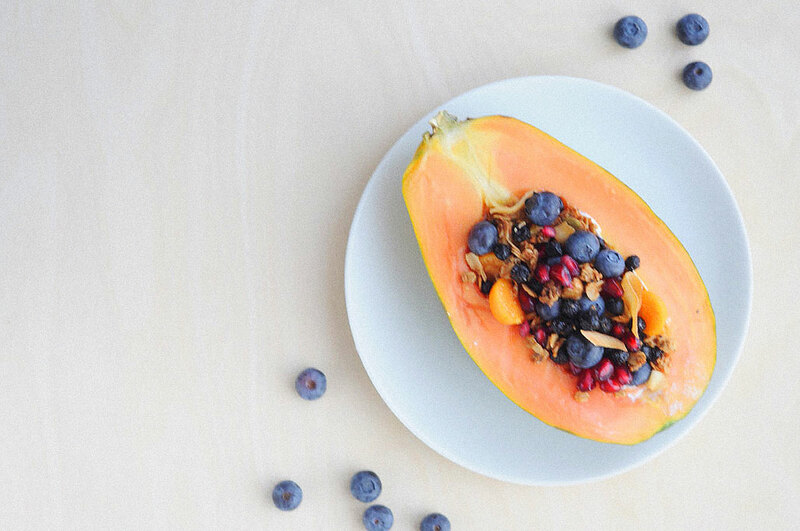 One cup of a papaya is about 15.7g carbohydrates, which is not ideal for a low-carb or keto diet but it is full of vitamin C and low in calories. Which is why the Papaya is perfect for the winter months to load up on vitamin C.
1. Cut the papaya in half and scrap all the seeds out of the center. 2. 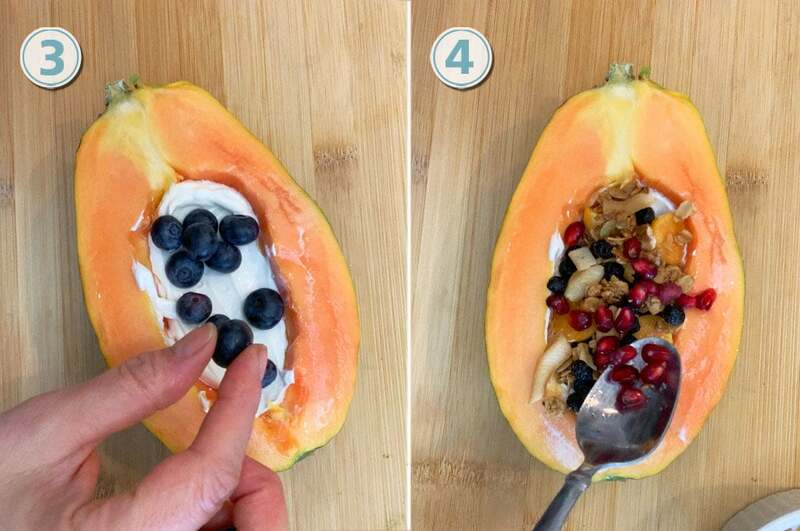 With a spoon, layer the vegan yogurt in the center of the papaya and even out with the back of the spoon. 3. Place the blueberries, gooseberries, on top. 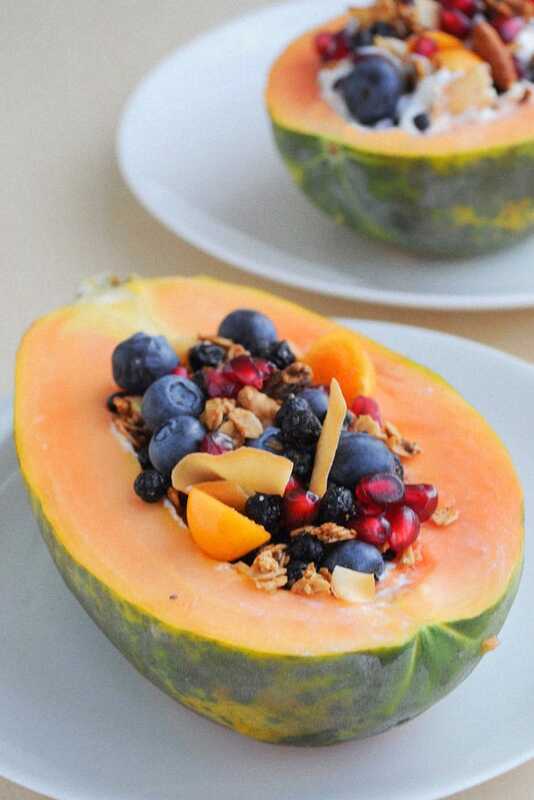 4.Add the granola on top to fill the papaya bowl. 5.Sprinkle the pomegranate seeds on top. Happy Eating! 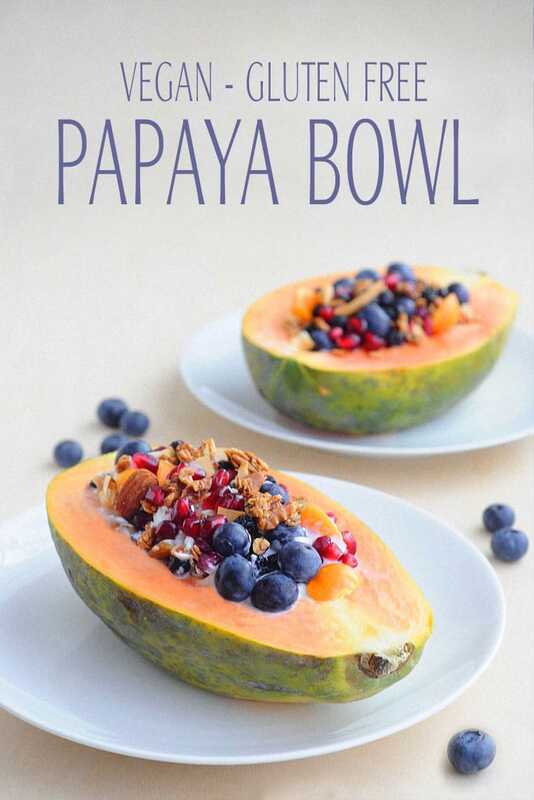 You can fill the center of the papaya bowl with other options. I sometimes will fill it in with chia pudding or make banana ice cream for the the center. 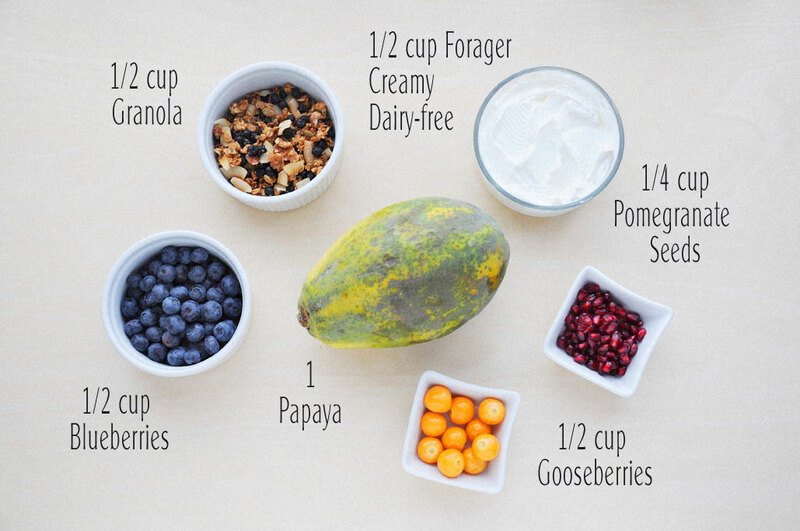 Depending on the season and what is in stock at the grocery stores depends on how I prepare the Vegan Papaya Bowl. 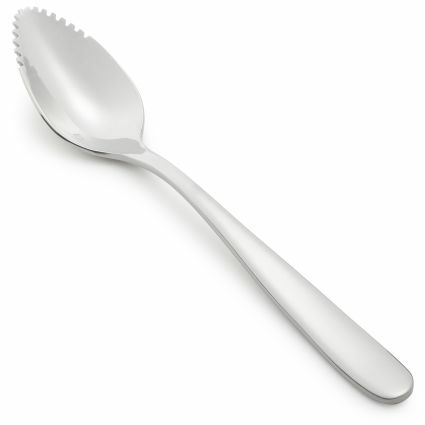 When I serve the Vegan Papaya Bowl, I will use a grapefruit spoon to eat my papaya. Once you own a grapefruit spoon you’ll wonder why you waited so long to have them in the kitchen. 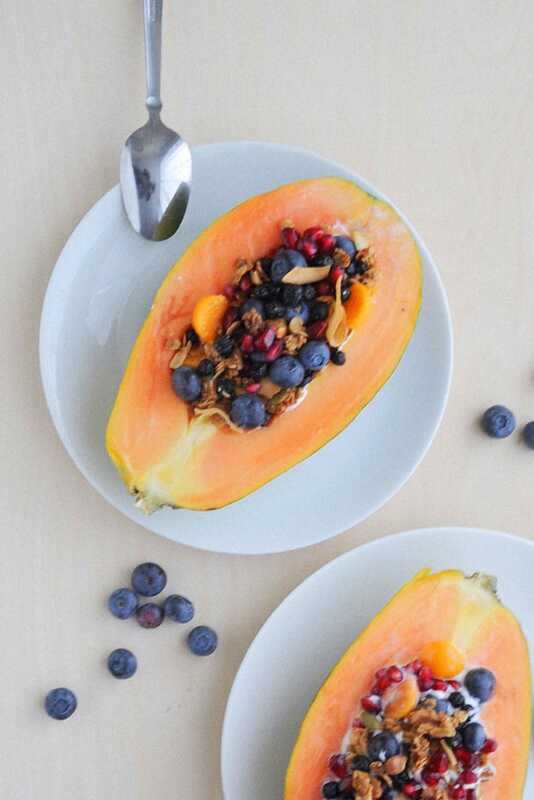 My Vegan Breakfast to start the day with a Papaya Bowl full of granola that is sugar-free and gluten-free. 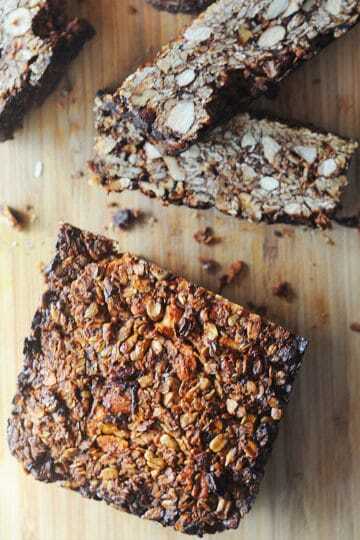 It's easy to whip up and perfect for a vegan breakfast. Cut the papaya in half and scrap all the seeds out of the center. 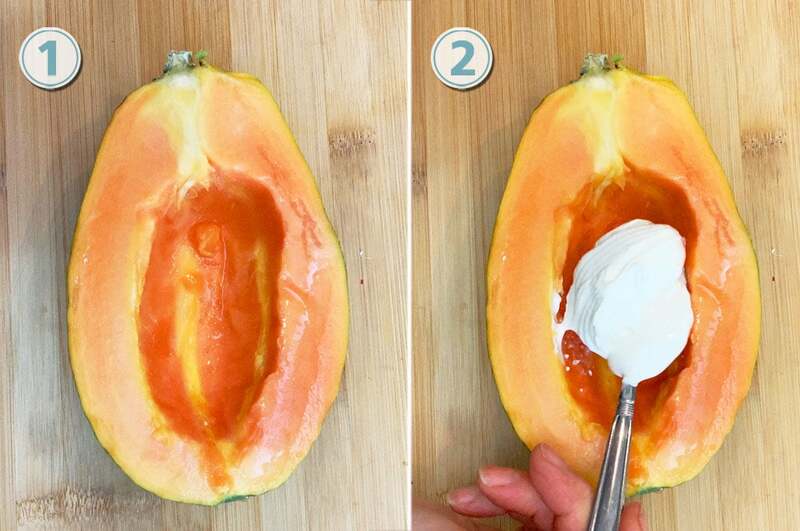 With a spoon, layer the vegan yogurt in the center of the papaya and even out with the back of the spoon. Place the blueberries, gooseberries, on top. 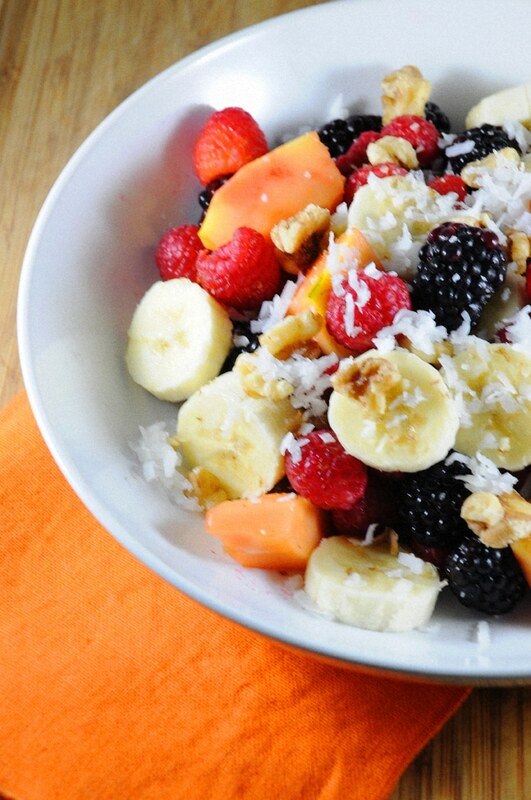 Add the granola on top to fill the papaya bowl. Sprinkle the pomegranate seeds on top. Happy Eating!